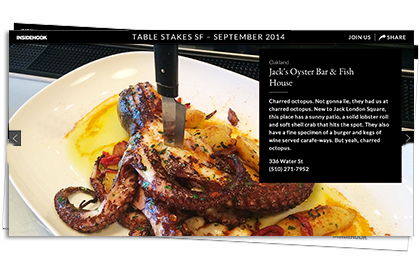 Because San Francisco loves its new eateries, almost as much as it loves its protected bike lanes, we bring you Table Stakes: a series that answers man’s eternal question (“Uh, what’s new?”) and circles back once every lunar cycle or so. Bon appétit. Labor Day is behind us. In these Bay Areas, that means the warmest month of the year is here. How best to celebrate? How we celebrate best: dining outdoors, bud. Five of the newest haunts to open in the last Gregorian 30. And more. Tuck in, good sir, and bring a date.